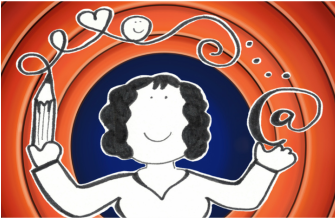 Cartoon communications creates bespoke cartoon illustrations and comic-strip stories to help people in their professional and personal lives. Sam Cowan is an award-winning artist who, as illustrated in the cartoon on the right, has curly hair, a smile and a pencil at the ready to help you. She knows that cartoons are an incredibly powerful way to tell a story and engage with an audience. Why say it with words when you can say it with a cartoon? Here is Sam in non-cartoon form (pictured left). ​To find out more about Sam's art, click here. Cartoon Communications can work with you wherever you are in the world. We begin with a chat to understand your requirements and any ideas that you may already have. This can be done face to face, over the phone or on Skype. Once the artwork is complete, it gets sent to you electronically, making delivery instant. Click here to arrange a preliminary chat with Sam.